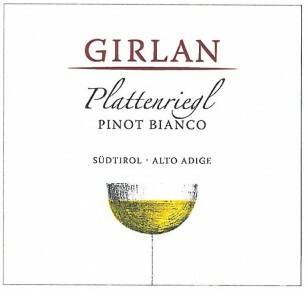 Plattenriegl (Monte Appiano) is among the best Pinot Bianco areas in Alto Adige. Vineyards are located at an elevation of 450 to 540 meters above sea-level. The gravelly, limey soil of the nearby Mendola mountain make a considerable contribution to the satiny full-bodied nature and fruity freshness of the wines made from grapes grown here. It is pale yellow in color with green reflections. It has a delicate and fresh citrus bouquet, and it is full-bodied on the palate. Thanks to its delicate, fresh and at the same time, full flavor, the Pinot Bianco Plattenriegl is the perfect wine for a host of different occasions. It is an ideal accompaniment for hors d’oeuvres and fish dishes as well as being very popular as an aperitif. Gravel and lime from the nearby mountains of Mendola. The grapes are picked by hand and placed in small containers to prevent excess pressure on the grapes. Gentle whole cluster pressing and clarification of the must by natural sedimentation. 75% is fermented at controlled temperature in stainless steel tanks, 25% is fermented in large oak barrels (50 hl.). The part in oak barrels is continued with malolactic fermentation. Aging on the lees for 6 months.